Armour of God ~ starring Jackie Chan (directed by him too) was released in 1986 and ran packed houses. The plot is about the hero, a former musician who becomes an adventurer and treasure hunter. After successfully stealing a sword from an African tribe, he has the weapon auctioned before it is won by May Bannon, the beautiful daughter of Count Bannon. There is this evil religious cult possessing two pieces of a legendary armour called the "Armour of God", and they intend to have Jackie bring them the three remaining armour pieces, including the sword. .. .. …. Sharing the new ball in conditions that initially encouraged seam and swing, debutant Hardik Pandya and Umesh Yadav ran through New Zealand's top order. From 65 for 7, New Zealand recovered thanks to Tom Latham, who became the tenth batsman to carry his bat through an ODI innings, and Tim Southee, who struck a 45-ball 55 at No. 10. He has played a dozen matches and has not bowled a single delivery; in IPL he was seen keeping wickets – but today with NZ 57/5 – though there were two spinners Amit Mishra & Axar Patel, Dhoni masterminded Kedar Jadhav to bowl. He could have had a wicket with the last ball of his first over, when James Neesham missed a sweep. In his next over, he got a ball to stop on Neesham, who closed his bat face a touch too early and presented a simple return catch. Next ball, Jadhav had the man who had scored in Test series, Mitchell Santner, cutting, top-edging to MSD for a 1st ball duck and Jadhav was on a hat-trick. Tom Latham became the first New Zealand batsman to carry his bat through an ODI innings. The name would literally translate into 'spiritual dwelling' or ‘place of justice’ – and when this ground made its debut, there were fears that snow would ruin the game. It is Cricket on top as the venue is located in the foothills of the Himalayas, 1317 metres above sea level. It is Dharamsala - a city and a municipal council in Kangra district in the Indian state of Himachal Pradesh. The Tibetan settlement of Dharamshala began in 1959, when His Holiness the Dalai Lama had to flee Tibet and the Prime Minister of India allowed him and his followers to settle in McLeodGanj (in Upper Dharmshala), a former colonial British summer picnic spot. 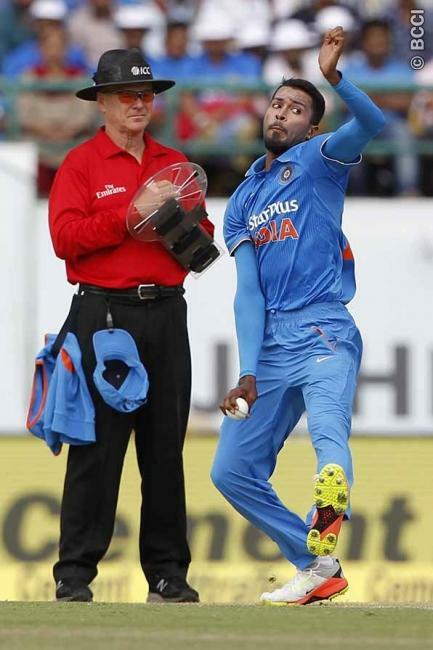 If you had observed the photo of Hardik Pandya bowling (he took 3 and got the player of the match) .. way back in Dec 6, 1980 – in ODI no. 97 at Melbourne, there were 5 debutants for India. Kirti Azad, Roger Binny, Dilip Doshi, Sandeep Madusudhan Patil and Thirumalai Echambadi Srinivasan. Sandip Patil was the man of the match with India winning by 66 runs. in the photo, you can see the Umpire wearing something different and intriguing ! After injuries to Umpires, especially when John Ward was struck on head at Dindigul in a Ranji and an official died in Israel, some have resorted to helmets and protective gears. The man, Bruce Oxenford, from Australia, had worn the lollipop-shaped guard in April during the IPL match between Gujarat Lions and Royal Challengers Bangalore, and earlier at a World T20 warm-up match between Australia and the West Indies. At Edgbaston, he proved more innovative entering the field, wearing a protective shield strapped to his left arm to protect himself in the modern world of big hitting cricket. The Australian official made the device, believed to be the only one of its kind in the world, himself at home in Queensland using polycarbonate and placing what looks like a large table tennis bat on the end to parry or deflect any balls heading his way. It looks quite different and odd shaped – so far, no ball has struck or got deflected by the device. There were queries on what will happen if the ball deflected by the device by a fielder and an out is claimed ? - perhaps that applies to any part of the body of the Umpire including any protective gear worn – should become a dead ball. I remember Bruce Oxenford for wrong reasons though ! - It was 29th over of the ODI 3244 between India and Australia at at Woolloongabba, Brisbane – 3rd ball of the over - Billy Bowden and SJ Davis were the ones on field. Mike Hussey missed a delivery from Suresh Raina and Dhoni did a smart stumping. The screen on referral to 3rd Umpire showed ‘Out” – Hussey trudged back, Billy went running after recalling. 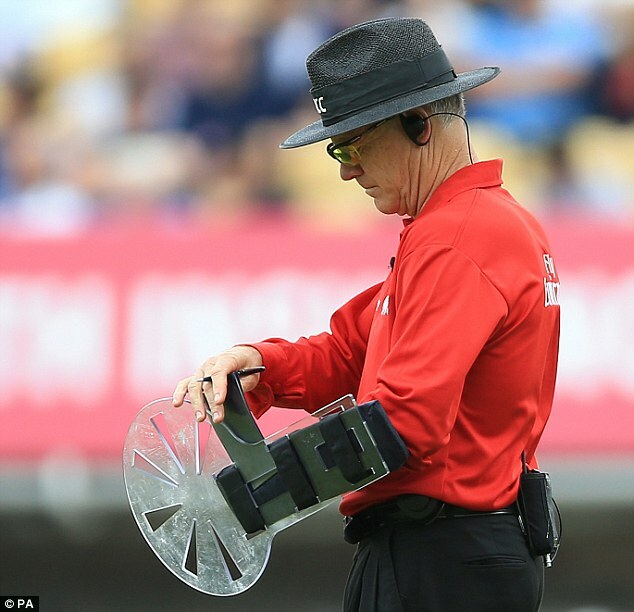 It was explained that the Third Umpire has told him that it was not out but had pressed the wrong button – it was not wrong technology but incapacity to do the simplest task – the man was Bruce Oxenford. In July 2012, at Hambantota in the 1st ODI, it ended up in a mess – total confusion in the modern World of communications !! It was ridiculous laughing levels as a serious loophole in on-field communication was revealed. By official Statistics, India opted for the batting powerplay in the 17th over – what a radical step one might wonder and they played out them tamely, as none – either the batters on the ground or the Captain, Coach, and players were aware of the same. It was later revealed that when Virat Kohli signalled to the dressing room for a cap, it was misunderstood by the Umpires - Bruce Oxenford signalled with the circular motion of the arm and a tapping of hands above the head indicating it to be decision of powerplay.